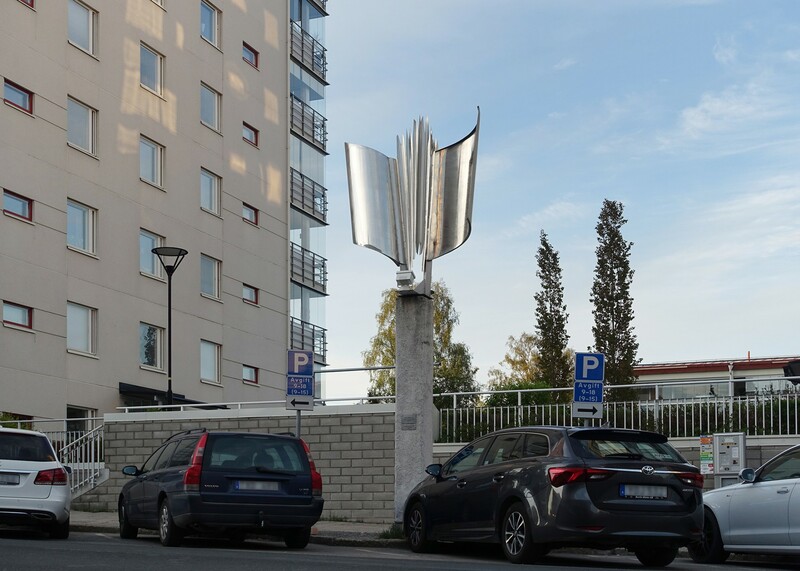 The monument by Toivo Lundmark, in memory of the attack on Norrskensflamman. Photographer: Thomas Hämén, 2018. Like Lundmark’s artwork Freedom, Thought, Life, we let the first issue of the Lulu-journal remember and reflect on the attack against Flamman – an act of terror with no equivalent in the history of Sweden. We focus on a time in Norrbotten and Sweden when the threat from surrounding countries provoked extreme responses of both military and private kind. Considering the geographical position of Norrbotten, its proximity to Finland and to the Soviet Union, tensions were especially prominent here. The attack can be seen as the culmination of the preceding years of nationalism, warmongering, and hatred against the communists in the region. Its features and planning are remarkable: one of the key agents in the act, Ebbe Hallberg, was state attorney and chief of police in Luleå. Together with a journalist at the conservative newspaper Norrbottenskuriren and some army officers, they organized and carried out the brutal deed with the aim of silencing dissidents. We will also direct our attention to the history of the Swedish government’s establishment of internment camps for anti-fascists and anti-nazis during the 1930s and 40s. The largest of the camps were located in the Norrbotten town Storsien in the Kalix municipality. Interned here were, among others, members of Flamman’s editorial staff. The camp and the attack overlap in time, sentiment and the destinies they affected. By addressing this dark history, we reflect on Sweden’s idea of itself and its neutrality. How do these events resonate today? What happens when we look back and remember together? And why do these stories feel especially pertinent at this particular time? These are questions we have raised in a research process that will lead us further towards the opening of the Luleå Biennial in November 2018. In this journal, we want to share the conversations and explorations that are not always present in a physical exhibition, but very much so in the curatorial work that underlies it. With the help of invited writers, we will make a collective attempt to formulate our ideas about the complexity of darkness; what do we see in the darkness? And what emerges in the light of distance? “The endless cruelty of a catastrophe consists in that its impact is most often felt entirely too late, only after it has occurred.” The poet Ida Linde refers to the philosopher Georges Didi-Huberman when, in this issue, she thinks through the disintegration of resistance and a forgotten chapter of Swedish history. Which catastrophe is it that we are not yet seeing? We are in Swedish Radio journalist Kerstin Wixe's kitchen in Luleå, January 2018. As a young journalist in the 70's, she was one of the first to write about the detention camps together with colleagues Ingrid Eriksson and Karl-Erik Larrson. The article was published in Folket i bild/Kulturfront. In the same magazine, from the same year, and as part of a series of reports headlined “Our Unknown History”, we also read Ulf Oldberg's thorough investigation of the Flamman attack, its aftermath, and testimonies. “The fire shimmers in the faces of many people”, he wrote. Now, we are re-publishing these two important texts. For this issue, we have also invited three writers to contribute contemporary reflections on the events. The Gällivare poet David Väyrynen has written the moving piece “For those who died in the fire". Writer and member of the Flamman staff, Judith Kiros describes the bond she shared with her previous colleagues, and the violence of the state apparatus in her text “The night has not come yet”, while the author Ida Linde went to Storsien, and in her essay “What I cannot see in Storsien”, reflects on the hidden darkness of the beautiful landscape. We also met with Lasse Brännberg from Luleå, who generously shared the testimony of his father, who worked at Flamman and was among the detainees, about the tensions surrounding the attack and what came after. The artist Edith Hammar has contributed with an illustration, and from the city archives of Norrbotten and Luleå we have borrowed pictures and archive material for publication. At the end of the journal, there is a bibliography for further reading. This list of materials and references is an ongoing work, and we are grateful for tips on additional texts, testimonies, and representations of the events, in order to make it into a living document that we can add to continuously. Despite the printing press having been completely destroyed, Norrskensflamman was quick to release the newspaper again after the attack. They opened with the headline “Is it true Mr. Chief of Police?” which referred to the rumor that the police chief and the public prosecutor Ebbe Hallberg had been involved in the attack. After a few weeks, Ebbe Hallberg was arrested as s suspect and his testimony was the basis for arresting the other perpetrators. The conservative Norrbottenskuriren held that Hallberg was insane, while NSD (the Norrland Social Democrats) argued that the fire was a “parallel event”, which the communists themselves were likely to be behind. As we learn about what happened then, we gain insight into the profound confusion at the center of these events, and how difficult it can be to know how to act in the right way. This leads us to our present moment and the shattered feeling that unites many of us now. With this issue, we are beginning to grapple with what happened then, which may help us, too, in grappling with the severity of today, in Sweden, August 2018.
editors and artistic directors of the Luleå Biennial. Lulu is how Luleå first appeared in writing in 1327, a name of Sami origin that can be translated as "Eastern Water". This is the title of the Luleå Biennial’s journal, published once a month from August 2018 through February 2019. Across seven issues, through text, image, and film, readers are offered different points of entry to the biennial’s overall theme: the dark landscape. All issues take as their starting point a public artwork in Norrbotten. The Lulu journal is made by the biennial’s artistic directors and invited guest editors. It is published on the biennial’s website and can be downloaded for printing.